Hello everyone! It's time for another blog hop from The Stamp Review Crew! 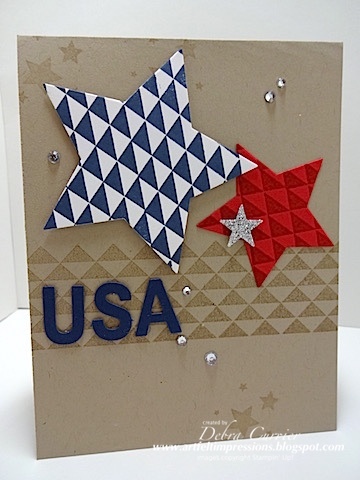 This time we are featuring projects that use the Dotty Angles stamp set! I am your stop right after the fabulous Rochelle Blok. I love this set! It is so versatile and fun to use! And it can be a great accent to any set and card! I decided to make a card to celebrate the Fourth of July! Time to send you on to see what the talented Nancy Smith has created! So glad you stopped by! Enjoy the tour! What a fun idea to use the triangles on your stars. I love it! Great patriotic card. I love that you used the kraft card base too. Really makes those stars pop! Way cool Deb! I never would have thought of that. I love it and it's an awesome card!